There’s no shortage of sports riffs as Bob takes the long view in his first volume of memoirs. Bob Dylan’s interest in boxing long predates his epic song about Ruben Carter. Remarkable, really. It’s hard to imagine anyone today writing a bona fide radio hit about a boxing life with so many turns. In his best-selling Chronicles Volume One, sports turns up routinely, especially as Bob reflects on his early days. He mentions the drive to break Babe Ruth’s home run record by fellow Hibbing, Minnesota native Roger Maris. Fans of his Theme Time Radio Hour (Season 2, Episode 4) may recall an outstanding episode devoted to baseball songs, familiar and wonderfully obscure. Personal favorites: “Don Newcombe Really Throws That Ball” and “Say Hey” with Willie Mays. Sister Wynona Carr’s “Life is a Ball Game” is pretty fun, too: “Third base is Tribulation. If you pass you can make it in.” It’s all on YouTube. The radio was playing and morning news was on. I was startled to hear that Pete Maravich, the basketball player, had collapsed on a basketball court in Pasadena, just fell over and never got up. 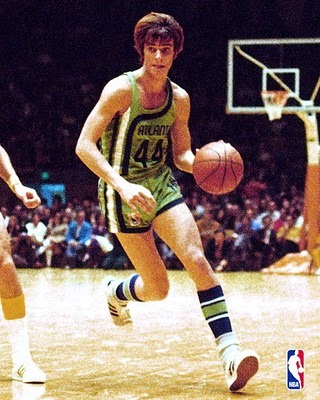 I’d seen Maravich play in New Orleans once, when the Utah Jazz were the New Orleans Jazz. What hoops fan wouldn’t have enjoyed seeing Pete for the Jazz, or the Hawks? He was something to see – mop of brown hair, floppy socks – the holy terror of the basketball world – high flyin’ – magician of the court. The night I saw him he dribbled the ball with his head, scored a behind the back, no look basket – dribbled the length of the court, threw the ball up off the glass and caught his own pass. He was fantastic. Scored something like thirty-eight points. He could have played blind. Pistol Pete hadn’t played professionally for a while, and he was thought of as a forgotten. I hadn’t forgotten about him, though. Some people seem to fade away but then when they are truly gone, it’s like they didn’t fade away at all.